Tonight a new WW1 Centenary drama series, The Crimson Field, will start on BBC1 no doubt sparking a fresh wave of interest in the Nurses of the Great War. 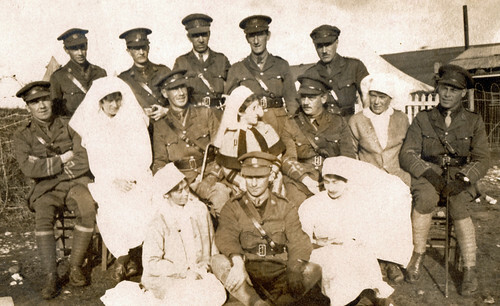 This image was taken in Northern France in 1918 and shows Queen Alexandra’s Imperial Military Nursing Service and also Voluntary Aid Detachment (VAD) personnel with the Royal Army Medical Corps medical officers from a Northumbrian Casualty Clearing Station. If you wish to read more about Great War Nurses Sue Light’s Scarlet Finders website is highly recommended. Sue can also be found on Twitter. 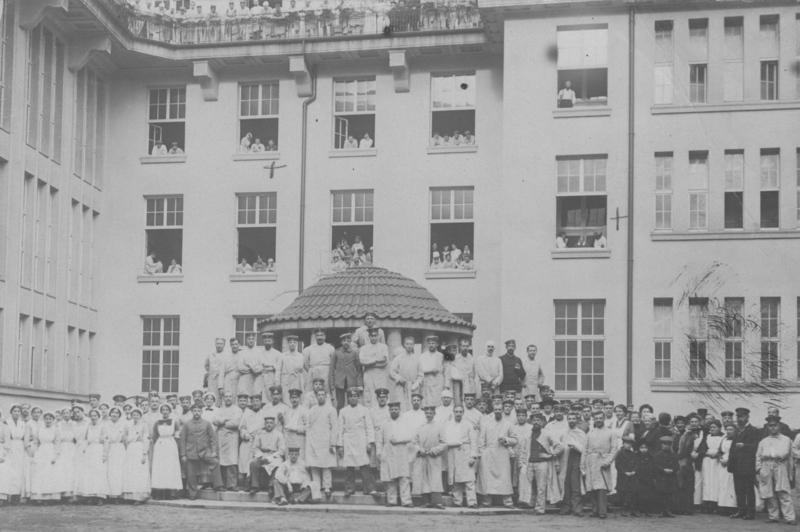 The role and experiences of female nurses in the German medical services during the Great War is something that seems to have slipped in our knowledge of the period. There appears to be very few, if any, memoirs of German nurses, compared to similar ones by British nursing staff. There also does not appear to be any form of official history of German nursing during this period and few mentions of them in German soldier memoirs. So this photograph is as much a question as an answer. 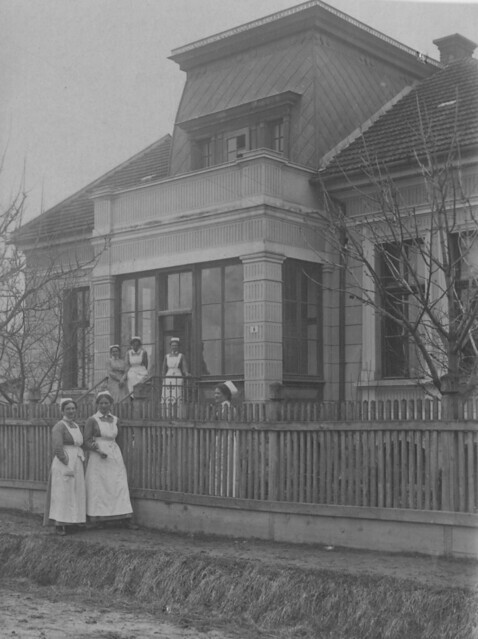 It shows German nurses in a building on the Eastern Front taken over as a hospital and dates from around 1916. During the Great War thousands of women served at home and overseas as Nurses working in military hospitals or in Casualty Clearing Stations closer to the battlefield. They provided vital skills and fulfilled an important role, one which is often overshadowed by the events on the battlefields themselves. 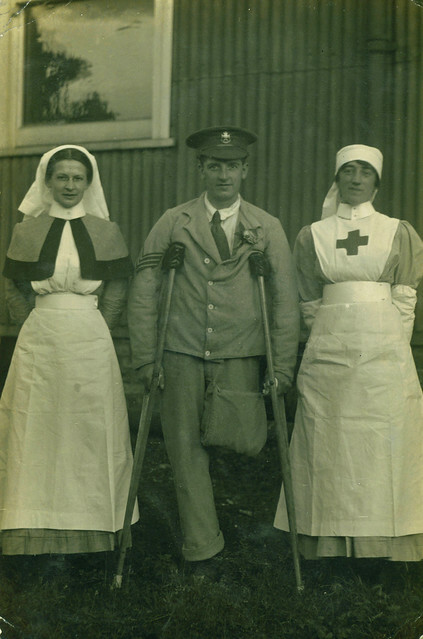 This image taken at a military hospital in Britain and shows a badly wounded Sergeant of the Sherwood Foresters escorted by two of the key types of WW1 Nurses. On the left is a member of the Queen Alexander’s Imperial Military Nursing Service (QAIMNS) who were the regular establishment of military nurses serving as part of the British Army; a Territorial branch of QAIMNS also provided additional personnel. On the right is a member of the Voluntary Aid Detachment (VAD); this was what many young women joined during the war – in fact as many as 100,000 joined it by 1918. Arguably the most famous WW1 VAD was Vera Brittain whose Testimony series of books provide a fascinating insight into the work of Great War nurses and how the war affected young women. For further insights on WW1 Nurses have a look at Sue Light’s excellent website and follow her on Twitter.